Summer and Fall 2019 dates coming soon! Join the founders of Maker Works for this inspiring five-day workshop, where you will learn about trainable, sustainable systems for smooth and safe operation of your own makerspace. We could not be more happy that my wife and I decided to attend your boot camp for maker spaces. The week long program was excellent. We found it in depth on day to day operations, management and strategy for a maker space of just about any type. But honestly, we found it was much more and much higher quality content than we expected. The boot camp was as much a general small business management skills camp, as anything else. Anyone, my partner and I included, building or running a small business would benefit tremendously from attending. That is what surprised me the most. Maker Works’ Makerspace Operations Bootcamp puts you in the middle of an established makerspace for a five-day inspiring deep-dive into the tools for running a sustainable makerspace. You have a space, you have some tools–now what? How do you keep members and tools safe? How do you instruct? What things need to happen every day to help you meet your vision? And by the way, what is that vision? The five-day course runs 9 AM to 5 PM Monday through Friday afternoon at our Ann Arbor shop and mixes classroom discussion and activities, Maker Works checkout classes, open time to make things, and local field trips to see these operational tools in operation in other business settings. Lunch and refreshments each day, a Monday evening social event, and a special lunch Friday are included. Books, a 124-page workbook with example documents, and other supplies will be provided. Attendees will have a regular Maker Works membership during the course (and two days before or after) to experience first hand making things in a makerspace, and can take checkout classes for free during that membership. See the link at the top of this page for the course outline. The Operations Bootcamp includes a tour of Zingerman’s Mail Order facilities, a reception on Monday night at Zingerman’s Roadhouse restaurant, and a lunch at Zingerman’s Delicatessen on Friday. Attendees will also leave with copies of Jack Stack’s The Great Game of Business and Ari Weinzweig’s Zingerman’s Guide to Good Leading, Part 1: A Lapsed Anarchist’s Approach to Building a Great Business. The Maker Works Makerspace Operations Bootcamp has run 2-4 times a year since 2014. Cost for the Makerspace Operations Bootcamp is $2,000 a person. See the online registration form here. The $200 deposit is refundable up to 1 week before the course begins. A discount is available for groups of 2 or more. Please contact us if you are interested in scheduling a course outside the regular course schedule. Co-owner Tom Root is a Zingerman’s Managing Partner and an owner of Zingerman’s Mail Order, a business with over $10M in annual sales and over 400 employees during the holiday season. Tom served as Zingerman’s first CIO, led open book financial management within Zingerman’s, consults on Lean operations within many of the Zingerman’s businesses, and is a frequent instructor for a variety of Zingerman’s classes. He began plans for a makerspace in Ann Arbor in 2008. Co-owner Dale Grover has a Masters in Electrical Engineering and a background in rehabilitative engineering. He is one of the founders of the A2 Geeks foundation. Dale started the monthly geek show-and-tell meetup GO-Tech in 2007, and was one of the founders of the technical coworking facility A2 MechShop in 2008. He joined Tom’s efforts to create a makerspace in 2010. Maker Works staff will also be available for discussions and shadowing. Any owner, manager, or staff that is currently or expecting to be operating a makerspace, hackerspace, FabLab, or any other shared fabrication facility. Big, small, for-profit or non-profit–every makerspace has to deal with how to keep members safe, machines running, and meeting the mission of the space. You will leave not just with example documents, but with the knowledge of how to create and customize these operational tools to fit your specific makerspace. And you’ll meet makerspace operators from around the country, each with their experiences and ideas. While this course is not about starting up a makerspace, you will benefit tremendously from taking this course well ahead of opening your makerspace. What are these tools and why do we think they work? We draw on many of the same tools that innovative organizations use today–Standard Operating Procedures, 5-S, Open Book Finances, and others–from business practices such as Lean manufacturing and Training Within Industry. We find these tools, combined with values derived from the Maker movement, help us continually improve in our delivery of our bottom lines. For example Tom’s business, Zingerman’s Mail Order, uses these same tools on a larger scale to train over 350 new employees in just a few weeks to handle the holiday mail order rush, with completed orders shipping up to every 8 seconds! While every tool may not work the same for every space, these tools have worked for us and we think they’re well worth sharing. 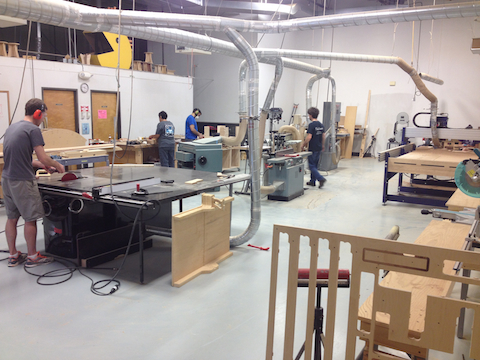 See also our blog post: Why a Makerspace Operations Bootcamp? See our Makerspace Resources page for a variety of resources for starting and operating a makerspace. We also have an article on using Standard Operating Procedures in a makerspace. Opened in September 2011, Maker Works is a 14,000 square-foot makerspace with tools and shops covering metalworking, woodworking, electronics, computing, jewelry, powder coating, and plastics and fabric fabrication. More than 1,300 paid members have joined since 2011, with many additional students and others receiving free or low-cost access. Maker Works serves businesses, hobbyists, craftspeople, and students of many ages. It is a for-profit business with three bottom lines: people, planet, and profit. We believe in and use Lean business practices, and practice open book management. Maker Works is located in Ann Arbor, Michigan, about 25 minutes from the Detroit Metropolitan Airport, and just 2 minutes off I-94. Refer to this map to find us in our industrial park. While there is a bus stop about 3/4 of a mile from the shop and transportation options to and from the Detroit airport, many people find renting a car at the airport a bit more convenient for getting around the Ann Arbor area. Ann Arbor is home to the University of Michigan, a vibrant downtown with plenty of dining and entertainment, and is near Detroit and its suburbs that offer world-class museums, multiple makerspaces, music, and other activities including The Henry Ford Museum and Greenfield Village. Most evenings will be free for making at Maker Works, relaxing, or exploring the area. Several makerspaces are located within easy driving distance, including suburbs of Detroit, Flint, Lansing, and Jackson. Ann Arbor has a wide variety of options for accommodations, and since it is not a very large city, few are more than 10-15 minutes away. Let us know if you are looking for something else. For more details, email membership@maker-works.com, or call us at 734-222-4911.